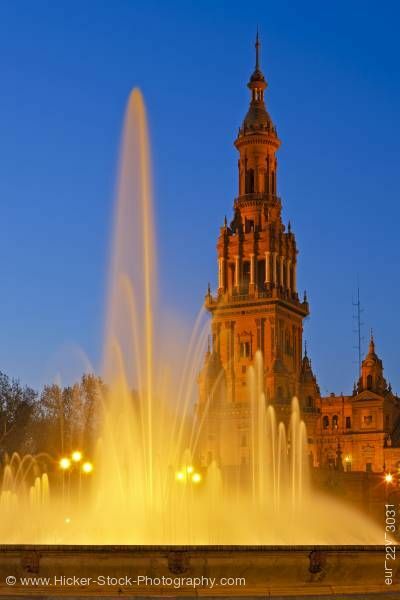 Stock photo of the tower and fountain at the Plaza de Espana, Parque Maria Luisa, during dusk in the City of Sevilla (Seville), Province of Sevilla, Andalusia (Andalucia), Spain, Europe. Evening lights capture the misty fountain and the tower of Plaza de Espana in the city of Sevilla. This stock photo shows the tower and water fountain at the Plaza de Espana, Parque Maria Luisa, during dusk in the City of Sevilla, Province of Sevilla, Andalusia, Spain, Europe. The misty waters from the fountain glow from the evening lights. Water spouts up in varying heights into the large fountain. In the misty distance of the fountain globes of light shine from the street lanterns. In the background of the fountain, the tower, part of the Plaza de Espana, stands tall in its wonderful details in Moorish Revival architecture. The tower is several stories high and its beautifully decorated architecture including columns, pilasters and a dome. Tower and fountain at the Plaza de Espana, Parque Maria Luisa, during dusk in the City of Sevilla (Seville), Province of Sevilla, Andalusia (Andalucia), Spain, Europe.